The premise is simple – a man gets a letter from an old female co-worker, Queenie Hennessy, who is now dying far away. He decides to write her a letter, or better yet, to pay a visit. So far, so good. It gets more interesting when the reader finds the trip is about 500 miles (800 k) and that this is a retired and married man who decides to just walk – sans phone, appropriate shoes or much other than the clothes on his back, a spot of cash, and his debit card. 1. The Year of the Hare (Arto Paasilinna – 1975) about a man who takes off walking almost the length of Finland (and see my thoughts on “walking” books). In The Unlikely Pilgrimage of Harold Fry, the eponymous protagonist walks through his memories as his physical journey takes him across the length England. These memories include how Harold feels he has aways let down the people he loves. From his mother’s abandonment to his son’s difficulties and his wife’s leaving his bed – Harold now sees the many ways he’s failed them. More and more of the backstory is revealed as the walking tale moves along. 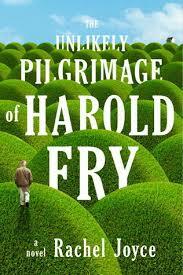 It’s written so the memories are completely interwoven into Harold’s daily doings – wonderfully well done. And the full narrative includes the current time-frame response of his wife back home who has her own memories, as well as the responses of those he meets en route, the response of the press and others. Imo, this is a very nicely written book – good linear structure with chapters switching between Harold and his wife, Maureen, and interesting metaphors. The message/point/theme might be a wee bit trite on the surface but keep reading all the way to the end. It’s one of those feel-good and possibly totally true messages I don’t really tire of as long as there’s a bit of something new in the format. Joyce’s work fits the bill. Harold may indeed be a Christ-figure here, or at least a Holy Fool, but perhaps he represents the Christ (Holy Fool) within us all as we walk our solo journeys through life. Faith and love are required for the journey – but so is support. That’s NOT the whole thing by any means.